This listing is for an awesome security system DIY electronics kit that detects noise and laser breach. It comes with all of the part talked about in the assembly video below, including a siren. It does not come with the AC adapter. If you want the correct AC adapter, contact us prior to buying, and we will arrange to invoice you $5 extra for one. The video above offers a full demonstration of the module when fully assembled. The video below offers step by step assembly instructions, so that you can follow along when you need to assemble the kit into a module. We sell these fully assembled and tested as well, so if you don't like soldering, have a look at our DIY science projects section. If you watch the above video, you will get several demonstrations on how this device works. It is extremely easy to use. THE SIREN IS EXTREMELY LOUD! THE VIDEO BELOW SHOWS YOU HOW TO PUT IT TOGETHER! BE SURE TO WATCH IT! As soon as you connect power to this device once assembled (9v), it will enter into a calibration state. If you make noise, you will see the on board LEDs light up from right to left, depending on how much noise you are making. Loud noises will activate all LEDs, all the way up to the left most LED. The slightest of noises will light up the right most LEDs. When you press the SEL button, all LEDs will flash three times. You will now have to choose the sensitivity of the audio detection. Remember, when you have selected this,the circuit will arm. The longer you hold the SEL button, the more LEDs will light up. As soon as you let the SEL button go, the last LED that lit up will be your sensitivity. 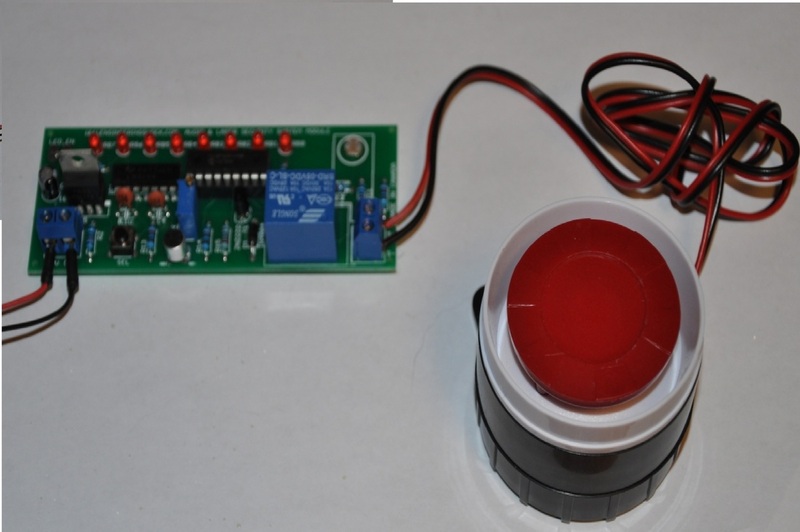 If you let go of the button with the left most LED lit up, then sensitivity will be extremely low, and you will need to create a ton of noise to activate the alarm. If you let go of the SEL button with the middle LEDs on, you will have moderate sensitivity. If you let the SEL button go with the first LED on, that means that you are going to have to creep out of the room, as even the slightest noise will activate the alarm. Good for scaring the crap out of people. Once you have selected your audio sensitivity, the device will arm. Be careful not to false activate the circuit when you leave. Note that if you will be using a laser with this board, the laser should be pointing at the on board LDR (Light dependant resistor) PRIOR to setting the audio detection level. The LDR is set up so that it is EXTREMELY sensitive to changes in light. If you choose not to aim a laser at it, even a shadow quickly enveloping the LDR will set off the siren. A Laser offers more stability. It makes things more interesting as well. When the alarm is triggered, the on board LEDs will flash, and the siren will sound off VERY loudly. In order to shut down device down, you need to hold the SEL button as the LEDs flicker off, and then let go of the SEL button. This will reset the module, and you will be back in the power on calibration state. 1) The Siren is EXTREMELY LOUD! Be careful not to use it near animals or children, or old people, as it may scare them, hurt their ears or worse. 1) A Mission Impossible Security DIY Kit with all of the components required for assembly. 2) A laser. I'll be happy to send you 2x 5v lasers if you contact me prior to purchase. Two 5v lasers will cost you an additional $2. NOTE: No Laser is included. If you want a laser, I sell plenty in my store.